There were minor differences between the USA and Austria front covers; image above from Austria. In many ways Percy Faith may be the most influential orchestrator of his generation; music inspired by him is by far the most common in the fabric of everyday life, and in a sense, it serves the same utilitarian function that music did to pre-westernized Africa: it’s not separate, you hear it behind you in the real world, in stores, building, airports, any public place where music comes out of a speaker. Faith carried forth a great tradition of music that, at one time, seemed destined for extinction, and in rethinking it to fit the times — several times in fact (he even successfully applied it to the pop songs of the late ‘60s) — extended it far beyond even his own life. Along with Mitch Miller, that factotum/prophet responsible for so much of modern popular music, and Ray Conniff, Columbia’s other ace baton-wielder, Faith can be credited with inventing the entire “easy listening” category. And yet, records were almost an afterthought in Faith’s career. Most of his energies went into conducting music on the radio (and later in films), and only when he prophesied the coming paucity of instrumental music on television did he begin to take the record business seriously. But very seriously! Not long after he and Tony Bennett both joined Columbia in 1950, Miller teamed them up, and the combination almost immediately began to move product in the big numbers (they were virtually the only singer-conductor pairing in the post-swing, pre-rock period to have no roots whatsoever in the big bands), and apart from all the careers he established as an accompanist, his own instrumentals landed the label nine major hit Lps and sold uncounted millions of units. Percy Faith (1907-1974) was born in Toronto, Ontario, and from his earliest days was recognized as a musical prodigy. At 11, he began playing piano to accompany silent films for the worldly sum of three dollars a night plus carfare. Within four years, he was considered one of the star pupils at the Toronto Conservatory of Music, and made his concert debut at Toronto’s equivalent of Carnegie, Massey Hall, playing Liszt’s “Hungarian Fantasy.” By the time he was 18, the city’s prominent bandleaders regularly approached Faith for arrangements, and he had also become half of a radio music and comedy act with a comic named Hope (not Bob, although the act was billed as “Faith and Hope”). Throughout the ‘30s, Faith conducted and orchestrated on Canada’s most popular “light music” programs, among them “Strings In Swingtime,” “Bands Across The Sea,” the very prestigious “Empire Broadcast” made to honor the King and Queen of England on the occasion of their visit to Canada, and his own show, “Music By Faith.” In all, he served as a staff conductor for the CBC for seven years, some of his broadcasts being heard in the states via the Mutual Network. The American break came when “The Carnation Milk Contented Hour” gave him the chance to replace the recently deceased Josef Pasternak, who’d been the musical director of the program since its beginning in 1932. Faith and family emigrated to the program’s home base in Chicago, and he conducted the Carnation show for another seven years beginning on September 2, 1940. The show and the Faiths moved east to New York beginning with the January 7, 1946 broadcast, continuing to play what one reviewer described as “popular (orchestral) music with a smattering of semi-classical.” Faith’s second American program, “The Coca Cola Hour,” began in October, 1947, adding to his orchestra singer Ginny Simms; the guest stars were popular musical entertainers like Oklahoma lead Alfted Drake and classical mouth organist Larry Adler on the first broadcast. His tremendous success in the record business inspired Faith and his 45-piece orchestra into other areas, most notably the movies: it was an obvious but effective idea that Faith’s highly commercial arrangements of the better and more successful movies themes would prove hits; and as you can see, nearly all of the 16 most requested tracks occupying this disc are cinematic in origin. (Jose Ferrer, the star of Moulin Rouge, gave his wife, Rosemary Clooney, a hot tip on its theme, “Where is Your Heart,” but she passed on it with the same marketplace misjudgment that almost made her miss out on “Come On-A My House”). Indeed, some of Faith’s interpretations have become more definitive than the originals, especially “A Summer Place,” and “Tara’s Theme” from Max Steiner’s Gone With The Wind. More then re-orchestrating other composer’s scores, in terms of both putting movie compositions on record and, for the Doris Day-Jimmy Cagney masterpiece Love Me Or Leave Me, reworking classic pop record tunes for the movies, Faith got into the act himself. His theme for The Oscar (long-time Faith collaborator, Tony Bennett, made his feature film debut as an actor, and recorded his own vocal version of the Faith theme on The Movie Song Album, reissued recently on Columbia compact disc 9272, was in fact nominated for an Oscar, and not just due to the subliminal influence of its title. The ties to movie and show music become very important when you consider the history of music on radio that Faith comes out of, as his friend, the veteran historian and musicologist Jim Maher, points out. Maher, who began listening to Faith during the ‘30s CBC broadcasts, explains that Faith’s great tradition — radio music — should be recognized as a distinct genre unto itself, which has close ties to the music developed in the early ‘20s to accompany silent films, and to arrange the songs and overtures of the “new” Broadway of Gershwin, Rodgers, and Kern. It began with network radio around 1927, out of the need for something grander than dance-band remotes, yet more intimate than anything the European “classical” tradition had to offer, and which could also accommodate musical comedy, ethnic and exotic elements, and, not least, jazz. It’s three most important exponents were Morton Gould, Andre Kostelanetz, and, says Maher, the greatest of all was Percy Faith. “Swedish Rhapsody (Midsummer Vigil),” Faith’s adaptation of a theme by H. Alfven featuring reed virtuoso Vincent James (Jimmy) Abato (otherwise best known for his duet with Sarah Vaughan on “Pinky”) resounds as a perfect example of Faith at his most successful. Although he had helped network radio to contend with television for perhaps the last time on his show, “The Woolworth Hour,” broadcast by CBS on Sundays beginning in April ’55 (Bennett headlining on the first show with “Don’t Tell Me Why”), his albums form his greatest legacy. He made 45 of them before his death at age 67, in 1974. According to Amazon, this CD was originally released in the USA on June 13, 1989. 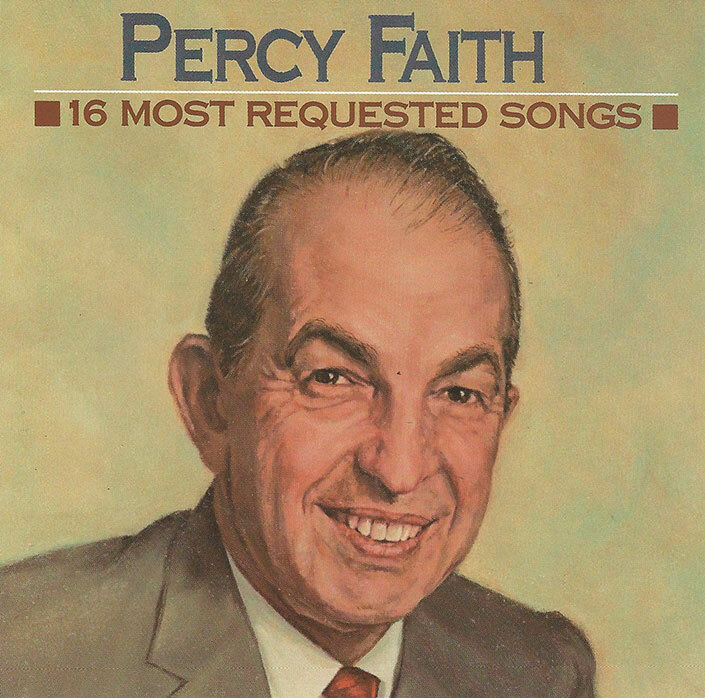 Although the second batch of titles in the 16 Most Requested Songs series was a minor improvement over the first, CBS was still having problems with fact checking: Percy Faith was born in 1908, not 1907, and died in 1976, not 1974 as the liner notes state.